That's a lot of pressure. It seems like every time I sit down to write a headline, that quote springs to mind. I'm nowhere near experienced enough at any of this to know what might make a difference. At best I'm just making an educated guess. But what if I guess wrong? Lately, when I really need a strong headline for a major blog post or sales page, I've been reaching for a simple tool. This tool takes the guesswork out of headline selection and allows me to relax and let the creative juices flow. I use Twitter ads to run cheap tests that allow me to find headlines that resonate with my audience. If you think about it, Twitter is a perfect platform for trying out headlines. A tweet is basically a headline–you have just a few words to grab attention and get someone to take action. 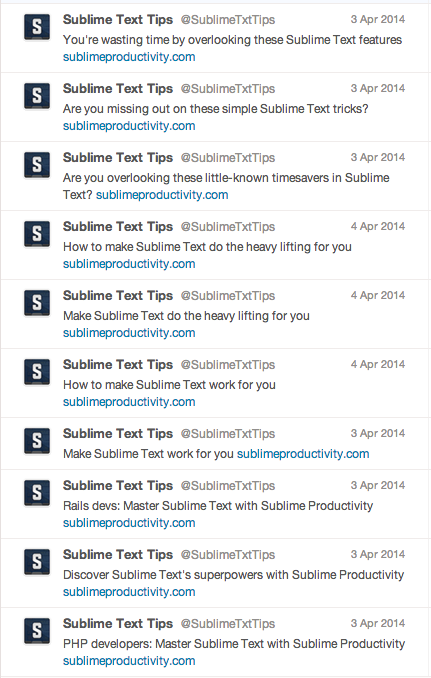 Here's how I used Twitter ads to try out a new headline idea for my self-published book, Sublime Productivity. The budding copywriter in me lit up when I saw that. Pure gold! Would the “superhero” theme make a good hook for my sales page? I thought it would. 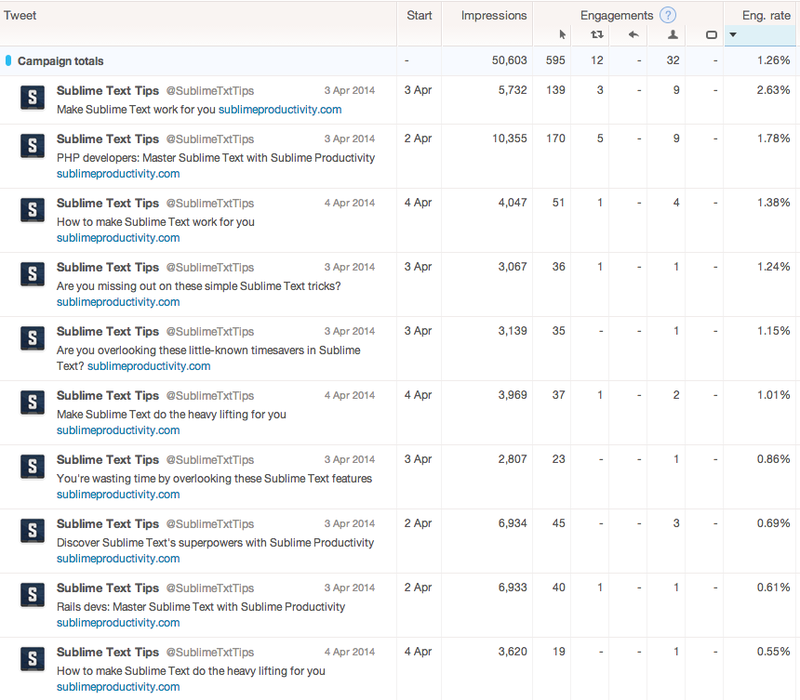 Before investing time actually writing a sales page to try out, I decided to test it out with a Twitter ads campaign. I originally got this idea from Tim Ferriss in The 4-Hour Workweek. He recommends using Google Adwords to test out product ideas before you invest any time in creating them. But when Derick Bailey introduced me to Twitter ads, it hit me that they were even better for this type of test. For one thing, it's cheaper. I've yet to have Adwords campaigns cost less than $1 to $2 per click, although I've heard it's possible. Second, Adwords ads impose a lot of restrictions on the length of your headline and body copy, and these requirements make it impossible to test a headline like you'd typically use on a blog post or sales page. To do this, I created a new “promoted tweets” campaign on Twitter. 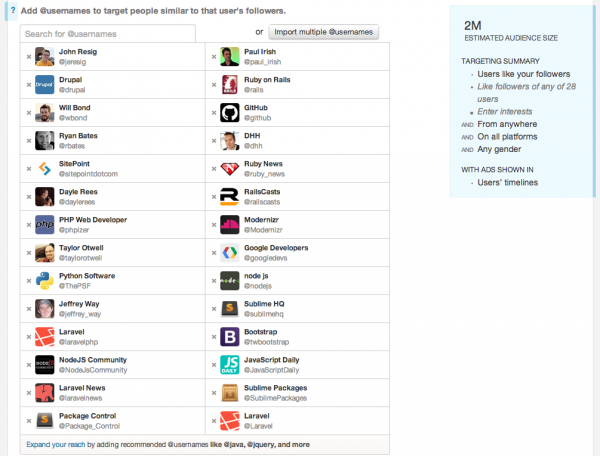 A promoted tweets campaign allows you to compose tweets and pay for placement near the top of Twitter users' timelines. I used a link to my existing sales page for these tweets. I wasn't expecting to sell any books this way–it's really tough to convert “cold” traffic from ads like these. But I needed to send it somewhere, so my book sales page was as good a place as any. Who should I show the ads to? One of the reasons I love Twitter is the way it allows you to pinpoint your audience by looking at who people are following. I built my @SublimeTxtTips account originally by following people who were following the official Sublime Text account. Can't get much more targeted than that. 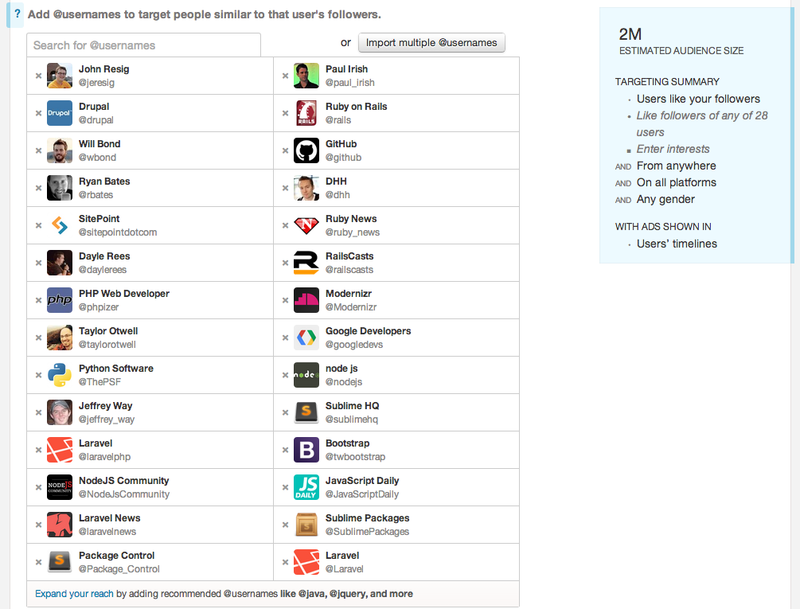 I focus my ad campaigns the same way–I target the people following big Twitter handles in my niche. For this test, I started with the @sublimehq and @sublimepackages Twitter accounts, then added a number of well-known web developers and web technologies. These people have raised their hands and expressed interest in my topic, rather than just mentioning the topics in conversation. Once my tweets and targeting were ready to go, I set a budget of $10 a day and let the campaign run for a bit. How do I gauge the results? 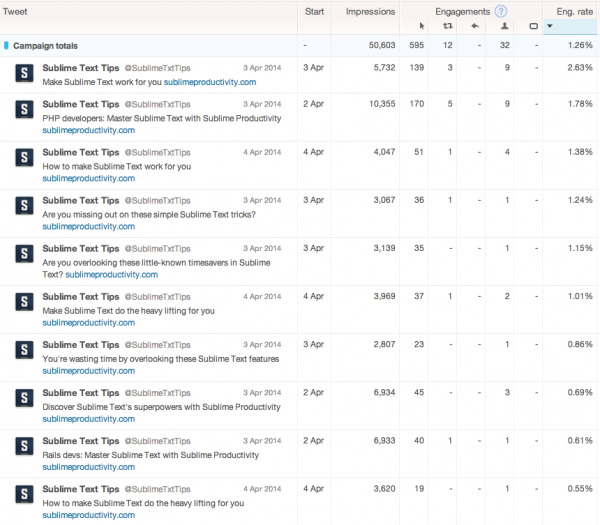 This engagement rate gives you a way to measure the amount of attention each headline attracted relative to the others. Generally speaking, an engagement rate of 2% and above indicates solid interest. It's quite possible to hit 3%, 4% or even 5% or better, but landing north of 2% is a decent result. Abysmal! With an engagement rate of 0.69%, it was one of the worst performers. In hindsight, that's not really surprising. It's usually better to be clear than clever in your ad copy, and I was breaking that rule here. That was one I threw in as an afterthought. It doesn't seem particularly interesting or attention-grabbing, but it achieved a respectable 2.63% engagement rate. This lead me to later try the same wording as a subject line for an email to my mailing list, and that test mailing received an excellent open rate of 56%. After that double confirmation, I'm planning to rework my sales page to lead with this headline. I can't afford to test every single headline I write this way, but when I'm trying to select a strong headline for a book sales page, or picking a title for that epic 5,000 word blog post that I want to go viral? In those cases, it's well worth dropping a few bucks on Twitter ads to make sure I pick a winner.